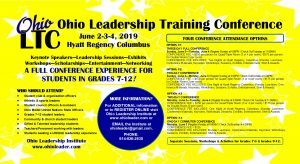 OhioLTC is a full conference experience for students in grades 7-12. During the leadership conference students experience keynote speaker sessions, leadership skill workshops, leadership learning sessions, visit exhibits, entertainment venues, dances and enjoy the networking experience of a leadership conference with their peers. PLEASE NOTE: OhioLTC participants can choose from FOUR ATTENDANCE OPTIONS designed to allow for optimum participation in OhioLTC. REGISTRATION DEADLINE IS MAY 15, 2019. AFTER MAY 15 CONTACT THE INSTITUTE FOR AVAILABLE OPENINGS. OhioLTC Guidelines & Polices and Code of Conduct – Please read before registering for OhioLTC. OhioLTC FAQ – Frequently Asked Questions About OhioLTC. OhioLTC Attendance Options – Four Attendance Options. OhioLTC Registration Form – To register by mail or email use this FORM. OhioLTC Medical Form – Please complete and mail to Ohio Leadership Institute, 240 Woodland AVE, Columbus OH 43203.